Parked in the Promised Land is an original 2.5 x 3.5” (ACEO) painting. It was painted with professional-grade water soluble colored pencil on UART sandpaper and comes protected in a clear polypropylene re-sealable card sleeve. This one-of-a-kind miniature painting is initialed on the front and signed on the back by the artist along with the title.To view more on this piece or to purchase, pleaseclick hereto go to my Etsy page. 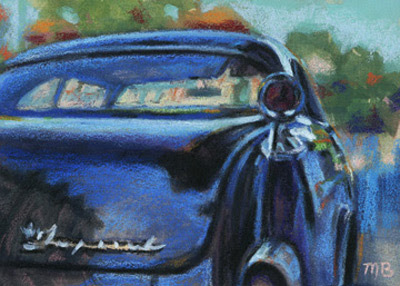 This little gem was originally painted for the ‘Old Car in Florida Challenge’ on the Daily Paintworks site. This particular challenge was hosted by Carol Marine. This was a fun little piece and not my first car, by any means. One of my most memorable was a Ferrari Testarossa along with the portrait of Fiat’s owner published on the cover of Manufacturing Engineering magazine back in 1987.